When people find out that we grow our own food I’m often asked what the best item for kids to grow is. Peas is always my answer. 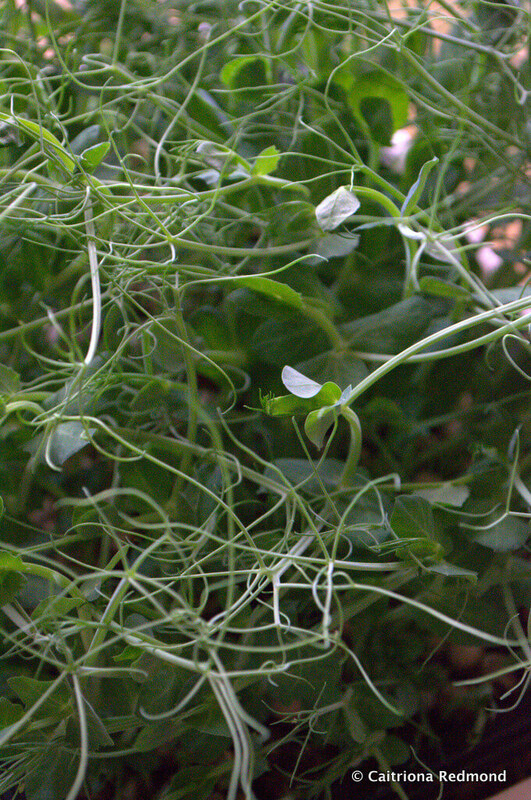 With peas kids can follow their growth from small shoots to big plants. They can eat the plant at any stage of growth – be it shoots, leaves, whole pods, or just little peas that have been podded. Peas were the first vegetable we grew in our front garden 6 years ago now. They’re also one of my favourite crops for all the reasons listed above. 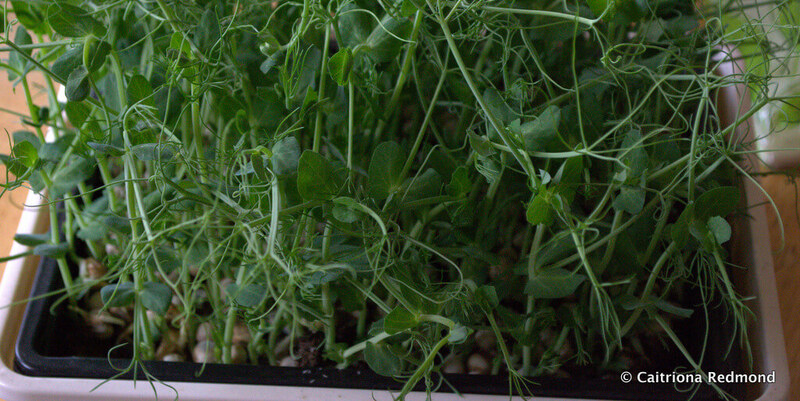 This year we sowed 6 main pea crops at the allotment, but I also keep a tray of pea shoots in the kitchen for salads and stir frys. They typically only take about 2 weeks to grow to a stage where I have to give the tray a serious haircut, but can be eaten as soon as the little shoots appear. I sow the peas thickly in a perforated tray on top of coir (also known as coconut flower soil). There’s no need to cover the pea seeds. The perforated tray sits inside a slightly larger tray, which is where I add the water to keep the peas topped up with plenty of water. Eating shoots/seedlings is something that is becoming more and more popular in Ireland. The tray you see here was given to me by Andrew Douglas of Dublin Urban Farm (if you’ve not heard of the project do check them out) as part of a recent tour for Bloom Fringe. It’s been recycled more than a few times since I took it home as it’s just the right size and shape for what I need. The lovely Happy Pear stock shoots in SuperValu stores nationwide, and keep an eye out for the just-as-lovely My Organics (aka Pots of Living) who are also stocked in some SuperValu stores. When it comes to harvesting the sprouts/seedlings it couldn’t be easier. I simply cut away what I need with a scissors, leaving the rest to keep on growing. It’s the ultimate way to keep food fresh. The rest of the salad comes mainly from the plot. The interloper being an organic shop-bought egg as we don’t keep poultry. 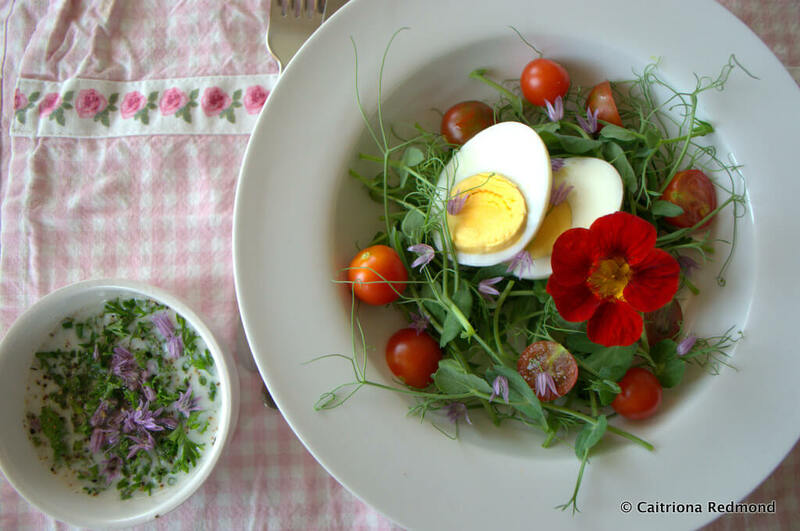 Everything else in the plate is freshly picked including various different tomatoes (spot the tiger tomato – full of flavour it’s become one of my favourites), the nasturtium flower is entirely edible, and the pretty purple comes from chive flowers which are also edible. It can be a little bit dry though. This is where great Irish buttermilk comes in very handy indeed. Buttermilk is a refrigerator staple in this house and it’s very rare I don’t have any. If you can’t get your hands on a decent buttermilk then mix 50ml of regular milk with a heaped teaspoon of natural yoghurt (that’s 50ml of milk for every 10ml of yoghurt approximately). For the dressing, take 2 tablespoons of buttermilk (30ml), and add finely chopped chives, parsley, chive flowers, salt, and fresh cracked black pepper. Stir well and allow to infuse for a second before pouring on your salad. It’s a very cultured life I lead!